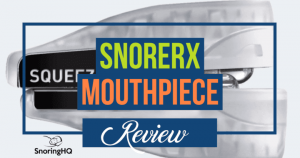 Snore Medic Review and Video: Does this Oral Appliance Work? There are many devices on the market to help people get a quiet night’s sleep. Snoring mouthpieces are a very popular method of reducing snoring. They are meant to counter the vibrations of relaxed throat muscles (also known as snoring) by comfortably restraining the organs involved in snoring. Here is my review of one of them: the Snore Medic. Snoring mouthpieces come in various shapes and sizes, making it difficult sometimes to determine the best one for your physiology. One question you might ask yourself is whether wearing a snoring mouthpiece at night is safe. The American Academy of Dental Sleep Medicine states that using snoring mouth devices is a safe and effective way to either reduce or stop snoring. A few other considerations when researching mouthpieces include how bulky the mouthpiece is, the size of your air passage, and the material from which the mouthpiece is constructed. You will be wearing the snoring mouthpiece throughout the night, so you want the device to be as slim and snug, without being too tight, as possible. A bulky device in your mouth can force your mouth into unnatural and uncomfortable positions. Ideally, your mouthpiece will be slim and unobtrusive while still effectively doing its job to reduce your snoring. Another consideration is the size of the air passage. At first blush, you might think you need the largest breathing hole possible with your device. In reality, if the air passage is too big, your mouth will remain open too wide during the night, making your jaw sore. The best device is one that has a large enough air hole for you to breath comfortably but doesn’t keep your mouth open too wide. Lastly, consider the material out of which the mouthpiece is constructed. You should look for a device made from a soft material that molds to the shape of your mouth. If the mouthpiece is made from an inflexible material, it cannot adjust to the width of your mouth, which will give you a very rigid and uncomfortable fit. The Snore Medic is a great anti snore device to try. It certainly can be a viable solution for many people. If it does not work for you, other more expensive options need to be looked at. Like the AirSnore and the SleepTight mouth devices, the SnoreMedic holds the jaw in place during the night, preventing it from falling back into a relaxed position. By keeping the jaw thrust slightly forward, the airway remains open, allowing you to get a restful sleep with unrestricted breathing. The device is very easy to use and is designed as a one-size-fits-all device, making it suitable for just about everyone. Although the appliance comes in one shape, the SnoreMedic uses the boil and bite method, allowing you to mold it to your mouth. You place the device into hot water for a few minutes, and then put it into your mouth and bite down. While the device cools, it will mold itself to the shape of your mouth, allowing you get an exact fit. If you don’t quite get the right fit the first time, you can repeat the process until you get the fit you want. The manufacturers of SnoreMedic recommend an adjustment period of 3 to 5 nights of consistent use for the device. Moderate soreness and fatigue of the jaw, teeth, and gums are common during the first few nights of use. This adjustment period is similar to any other type of mouth guard or dental device you might try. If the pain while wearing the SnoreMedic is severe, sharp, or ongoing, you should discontinue use and seek the advice of a medical professional. These extreme symptoms of pain may be an indicator of a more severe problem such as temporomandibular disorder, which should be checked by a medical professional. The SnoreMedic usually lasts 8-15 months with consistent nightly use before you need to replace it. If you grind your teeth at night, you might need to replace your SnoreMedic more often. Snore Medic does offer a discount if you sign up for their convenient program to have a new mouthpiece automatically sent to you every 8 months. 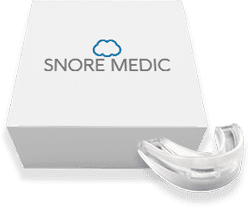 I’ve tried various mouthpieces in my research and I think the Snore Medic rates as an average device that can be found online at a decent price. It did a decent job of reducing my snoring, but I was not blown away by the product. It is fundamentally the same product as the SleepTight and the AirSnore. However, at $39.99, the Snore Medic is a much better deal than the SleepTight. The AirSnore ships from the United Kingdom, making the shipping time longer, so the Snore Medic (which ships from the United States) is a better deal in that respect. Easy to Mold. The Snore Medic uses the “boil and bite” method to help you get a custom mold. 30-Day Money-Back Guarantee. If you purchase the Snore Medic directly from the Snore Medic website, you will have a 30-day money back guarantee with a full refund, no questions asked. Snore Medic will also exchange products if the device you received was defective or damaged. The return and refund process just requires a simple online request form. Less Expensive Version of Other Products. The Snore Medic is a less costly version of the AirSnore and the Sleep Tight. If those products work for you, then consider the Snore Medic as a less expensive alternative. Their auto-renewal program is also convenient if you decide the Snore Medic is an effective device for you. Not Really a Mandibular Advancement Device. 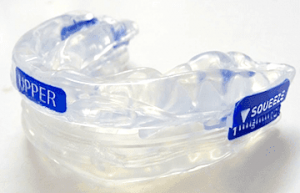 A mandibular advancement device (MAD) is the most common type of oral anti-snoring device on the market. Its role is to bring the lower jaw forward at night to help prevent snoring. Because there was not much lower jaw adjustment, I felt that the Snore Medic functions more like a mouth breathing device than a MAD. Not Really a Tongue Retaining Appliance Either. The alternative to a MAD is a tongue retaining appliance. A tongue retaining appliance uses suction to hold the tongue forward in the mouth to prevent airway obstruction. The Snore Medic does not adjust the lower jaw very much and does not include any tongue restraining features, making it a weaker appliance. Points of Discomfort. I experienced an uncomfortable increase in saliva production while wearing the Snore Medic at night. My discomfort with the saliva production was only made worse by the difficulty I had swallowing while wearing the Snore Medic. Having excessive amounts of drool without being able to swallow was uncomfortable. It also took me some time to adjust to the fit of the Snore Medic. The manufacturer does say it can take 3-5 nights to get used to the device and it did take that long for me to adjust.